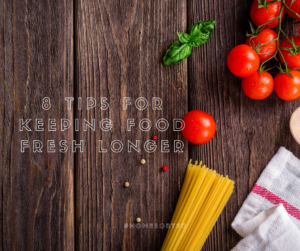 8 Tips for Keeping Food Fresh Longer - Home Sorted! Reading this with a refrigerator full of spoiled produce? Keeping food fresh is easier than many of us realise. Here, we share with you our top eight tips for keeping food fresh. One of the first things we recommend to any new client is that they use air tight containers in their pantry. Not only does this allow you to sort and stack your perishable items easily, but it ensures these items stay fresh longer! Each time you go grocery shopping get into the habit of rotating the oldest items in your pantry to the front. This will ensure you use the items with the shortest best before date. Do you line the bottom of your crisper drawers with paper towel? Well, you should. The paper towels will absorb excess moisture and help keep many different foods fresh. The same goes for how you store your fruits and vegetables in the crisper drawers. Always separate fruit into one drawer and vegetables into another; this will prevent them from rotting the other earlier than expected. Want to keep your bananas fresh? Don’t separate them before eating. The number one trick to stop them from going brown is to keep them together for as long as possible. You can also wrap the stems in cling wrap to extend the life of your bananas. Meat often comes in vacuum sealed packaging for a reason – it keeps food fresher longer! Do yourself a favour and leave meat in its original packaging until you’re ready to cook it. Did you know that storing dairy in the refrigerator door is a no-no? This is the warmest area of the refrigerator and therefore causes items like milk to go off quicker. Save this space for juice and soft drinks. Finally, when shopping it’s always a good idea to check the use before dates of any items before placing them in your trolley or basket. What’s the point in buying milk that expires in three days if they have a carton that expires in five?